Table Manners Cards - Kids Love Them! 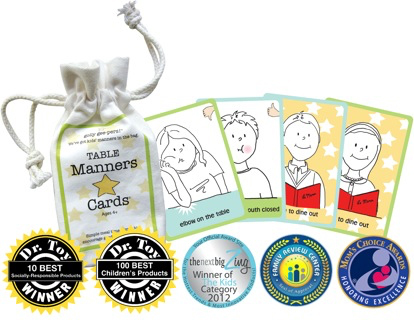 Table Manners Cards - Kids Love Them! Today's families are super busy and sitting down together for meals tends to be an exception rather than a rule. When you do have this opportunity you want it to be an enjoyable experience, not a time when you are criticizing your children or nagging them over their manners. What to do? Forgo teaching manners? Absolutely not! Bring out the Table Manners Cards. This fun mealtime game encourages your little diners to compete for thumbs-up cards while avoiding thumbs-down cards in an effort to win a coveted Ready-to-Dine-Out award. Once introduced, kids will want them at every meal!